Google has launched a major upgrade to its popular Google Earth app for Apple's iPhone, giving you the option to take your customised Google Maps with you wherever you go and adding numerous improvements to the usability of the world's best mapping app. Google Earth 2.0 is already up on the Apple iTunes Store to download (for free) following the original launch of the app just over a year ago. 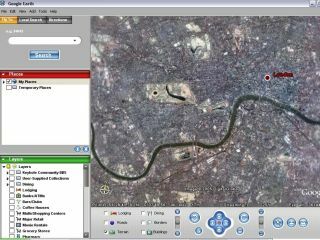 Google Earth for the iPhone and iPod touch has been "one of the most popular applications in the App Store, and after only six months, was the second most-downloaded free application overall" notes Google's Lat Long Blog. Version 2.0 of Google Earth for iPhone adds the ability to view your customised maps created on your laptop or desktop right from your iPhone, as well as introducing a number of new languages and improved usability features. To view your own (or your friends') maps you simply log-in to your Google Maps account using the new My Maps interface on the iPhone. "Maybe you're on a trip and want to see where Tony Wheeler, the co-founder of Lonely Planet, most likes to travel. Or perhaps you're walking around looking for a restaurant and you want to see where world-famous chef Ferran Adrià likes to eat," teases Birch on the Google Lat Long blog. Or perhaps, more prosaically, you might just want to use a route to travel up to the north of Scotland this coming Christmas that your father-in-law recommended for having the most scenic views.